Cucullia serraticornis Lintner, May 1874, Entomological Contributions, 3:174. 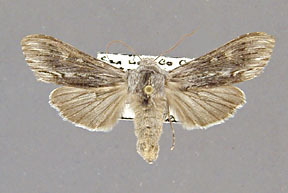 Cucullia solidaginis Strecker, September 1874, Lepidoptera, Rhopaloceres and Heteroceres, Indigenous and Exotic, 10:94. Cucullia matricariae Strecker, September 1874, Lepidoptera, Rhopaloceres and Heteroceres, Indigenous and Exotic, 10:94. Diagnosis: Cucullia serraticornis Lintner is a sexually dimorphic species known from southern Arizona and California from the Mexican border as far north as the Oregon border. The males are uniform gray with little significant maculation except for various fine black streaks. 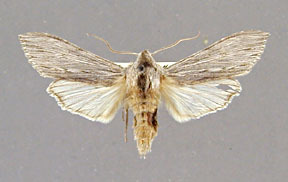 The male hindwing is pure white dorsally except for darker veins and a thin brown outer margin. The female is darker than the male and suffused with smoky brown. 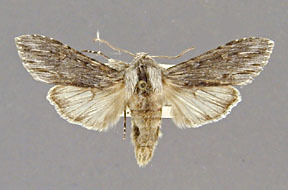 The female hindwing is dark smoky brown, not white. 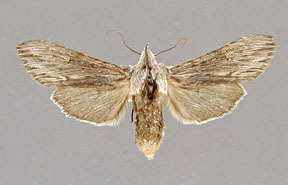 Cucullia serraticornis is superficially similar to Cucullia comstocki. 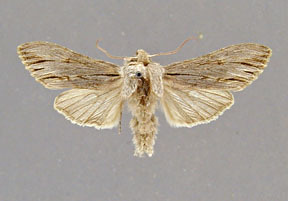 Males of comstocki are more contrastingly marked than serraticornis and have distinct patches of dark scales between the veins of the hindwing. Males of comstocki have a distinctly striate appearance normally lacking in serraticornis and the veins of the hindwing are more strongly streaked with black. Females of serraticornis and comstocki are very similar although females of comstocki tend to have more sharply defined light and dark areas in the forewing. The reniform mark in particular is distinctly present in comstocki but normally diffuse to absent in serraticornis. There are distinctive differences between the species in the shape of the male valve. The valve is longer and narrower in serraticornis than in comstocki. The ratio of the length of the valve from the base of the sacculus to the apex is approximately 5.5 in serraticornis versus 4.7 in comstocki. The apex is elongate and pointed outward in serraticornis. The apex is pointed in comstocki as well, but the apex is bent upward (in the orientation of the figure). The clasper is shorter and thicker in comstocki than in serraticornis. 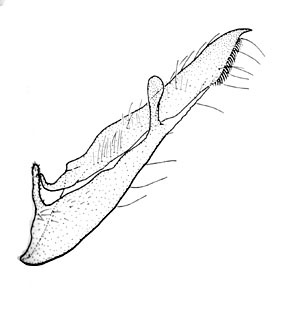 The spines of the corona run along the outer edge of the valve in serraticornis, but in comstocki the corona spines turn inward on the valve at about half the width of the valve. The basal processes of the sacculus are slightly longer in serraticornis than in comstocki. No differences have been found between vesicas of the two species. 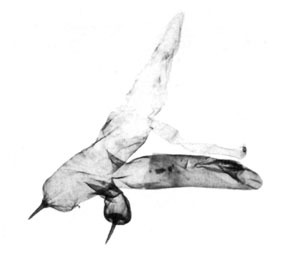 I have been unable to find any consistent differences between the female genitalia of serrticornis and comstocki. Cucullia serraticornis may be distinguished from strigata by the lack of sexual dimorphism in strigata and the more distinct maculation of strigata. The clasper of the male valve is much thicker and broader in strigata (about 3 times as long as wide) than in serraticornis (about 5 to 6 times as long as wide). Females of the two species are easily separated by the absence of sexual dimorphism in strigata (i.e. the female looks like the male). The female genitalia are easily separable as well. The ovipositor neck is twice as long as wide in strigata, but equally wide as long in serraticornis. In addition the ductus bursae is about 4 to 5 times longer than wide in strigata, but only 3 times as long in serraticornis. Cucullia albida occurs well outside the range of serraticornis. 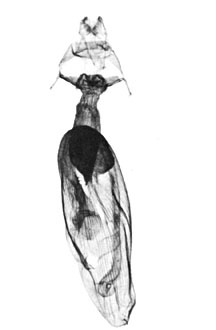 The male genitalia of albida are virtually identical to those of strigata. Wing length from base to apex: mean = 21.61 mm., standard deviation = 1.08 mm., n = 10. Distribution: Cucullia serraticornis lives in southern Arizona and western California. In California it occurs from San Diego in the far south, throughout the western and Central portions of the state at least as far north as Del Norte County on the Oregon border. It appears to be most common in the coastal regions of California and absent from the eastern portions of the state. 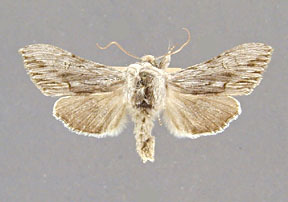 The apparent lacuna between the Arizona and California populations may be the result of inadequate collections of these early spring flying moths. 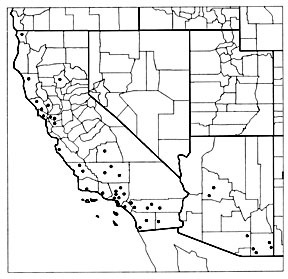 Southern California specimens have all been taken in January and February, San Francisco ones in March, and Arizona specimens in March and April.